Buying a paddle board is an investment in fun, lifestyle and exercise. This sport makes an excellent workout, but it also brings in lots of fun. Plus, anyone can learn to do this – you don't need to take a course. But then, choosing the right paddle board can be tricky with so many options out there. Sure, ISLE Classic Stand Up Paddle Board might be a top runner, but it still pays off going through the best paddle boards out there before making a final choice. Choosing the perfect paddle board implies going through a few steps. First, you'll have to determine your needs and expectations. Second, find out what to look for in a paddle board. Third, go through the top selling models on the market and find out how they can enhance your experience. It sounds daunting, but it's a matter of a few hours. So, what are your top options out there? A good paddle board will likely bring a series of benefits over your body, such as improving balance. Standing on a paddle board while going over waves will push your core to a new level. It will strengthen your legs, as well as the back. Apart from paddling balance, you'll benefit from improving your focus, as well as your balance in everyday tasks. If hitting the gym is not your thing, yet you want to stay in good condition, paddle boarding might be the ideal solution to mix fun and exercise in an efficient way. Pretty much every muscle will be used at one point or another while paddling. Your legs must stay strong, while the core will always be worked on in the attempt to maintain the balance. As for paddling, you'll use your arms, back and shoulders. The beauty of paddle boarding as a sport is that it has almost no negative impact over your body. Unlike weightlifting or other types of exercises, you're less likely to damage your joints or tendons. From this point of view, many therapists recommend this activity to weak patients. It's ideal to those who need a good exercise but suffer from specific issues, such as hip or knee pain. There are multiple ways to reduce stress (the modern enemy of the human body) and paddling is definitely one of them. You don't have to be a scientist to know that water can soothe the body. At the same time, mild exercising will work against stress. The sounds of water as you glide through will add to the whole experience. You'll feel like walking on water – what can be more calming than that? Spending a whole day paddling will make you feel sore, especially if this is the first workout you have in a long time. What does that mean? Simple – you're building strength. Doing it on a regular basis will remove soreness but will keep increasing your strength. It's not an arm workout though. Instead, it works on your whole body and ensures an even growth. Spending time on the paddle board on a regular basis will boost your cardio results. It makes a solid cardio workout to keep your heart in good condition. Unless you paddle alone, it pays off making this adventure more challenging and exciting by racing your friends. You might run out of breath, but the results are worth it. Given the low impact profile of paddling, this kind of exercise is often recommended by specialists. People of all ages can benefit from regular physical activity in the attempt to recover after an injury. Simply put, paddling will increase the strength without harming you, especially when it comes to joints and muscles. Last, but not least, learning how to stand up on a paddle board can be tricky. The more you paddle, the better you become. What does this tell you? Exactly! You're improving your endurance. Your balance gets better, your muscles can go for longer periods of time and you'll no longer feel tired. Browsing through the best paddle boards for 2018 will inevitably bring in the ISLE's classic board. It's one of the most complete models out there and makes a good choice for multiple types of boarding. In terms of sizing, it's 31 inches in width and 128 inches in length. It's somewhere in the middle segment. It's excellent for families, but also for single riders and even more experienced users. It weighs 27 pounds and can take people up to 275 pounds in weight. In other words, it's suitable to overweight users looking for some paddling adventures too. The design is rigid and solid. It feels stiff, which means it's stable. From this point of view, both beginners and experienced users will enjoy it. You can use it on flat waters on a lake, but you can just as well try it out on small waves. 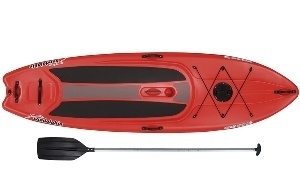 It's a middle choice for those who like both surfing and calm paddling adventures. Despite its rigid construction, the top deck is soft and comfortable. Also, it has a high density bottom, as well as an EPS core with a triple stringer system. It's worth checking the whole package when buying a paddle board, only to make sure you won't have to purchase required accessories separately. This model comes with a full package though. It has an adjustable paddle, so you can change its length based on your height. The center handle is also included, not to mention the fin. As for colors, you'll like the cocktail of light blue and white – the colors of sea and sun on a perfect weather. This board is literally inviting you to take it out on water. Despite the size, carrying the board around is simple due to the center handle. Looking for a surfing paddle board? Search no more! 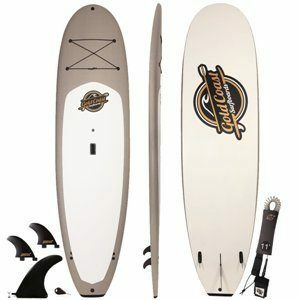 Gold Coast Surfboards is specialized in this category. This model is 10 foot long and 32 inch wide. 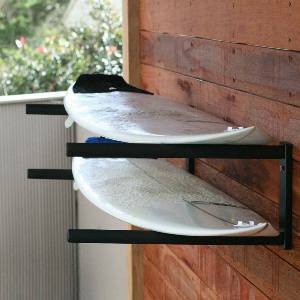 It's the standard size for surfing boards and can take riders up to 275 pounds in weight. The top deck is soft and feels comfortable, but it also prevents slipping due to the IXPE traction layer. Moreover, the board allows vertical storage by itself, so storing it should never be a problem. Its design goes further than that though. Just like other models from this manufacturer, it is custom molded with EPS closed cell foam. The material can last for ages, while its high density adds to stability. Plus, you have two wooden stringers going over the whole length of the board and a thick layer of resin for rigidity. The resin is also responsible for the shiny and smooth appearance of the board. It's a fully featured product with everything you need in the same package. Basically, you have a fin set (as well as the screws and key), a different 9 inch fin that can be mounted without any tools, as well as a coiled leash. The paddle board is made of aluminum and can be adjusted in height. It has its own storage bag. Some of the features that make this model unique include the core heat release valve, the top deck nose bungee straps and the nose plugs for GoPro or other similar equipment to take exquisite footage. The board features a classic carry handle, so moving it around should be a breeze. Available in a few different colors and with plenty of stability, this model from Sun Dolphin is among the best out there for beginners. While it's not advertised to be designed for beginners, it comes with a series of characteristics that will make paddling piece of cake, even if this is the time you engage into such an activity. Loading, unloading and moving the board around is easy – it weighs around 50 pounds. It's quite lightweight when compared to other models in this segment. Sure, the shape might make it uncomfortable to carry, but then, it has five carrying handles located in different parts. No matter what kind of grip is easier for you, this board will make it even simpler. It measures 120 x 33 x 10 inches. It's practically wider than other similar boards, but also thicker. Being wider means you have more stability on water. The same goes for its thickness. Paddling and tracking should be simple, while taking turns might need some exercise. Sure, it will take some time to get used to this sport, but turning slowly is the key to mastering the skill. The extra stability makes it even easier to practice without risking to fall. The board features a fin for even more accurate tracking. The surface smooth and comfortable. There are two wide and long areas on each side of the board designed to prevent slippery. That's where the feet should be. It doesn't mean you're restricted to a particular riding position though, as the foot pads are quite large, so they provide some mobility too. The recessed area is supposed to stay cooler and features a strap. If you're up for long distance paddling or you want to take the board on a camping trip, you have a decently sized storage compartment in front of it. It has shock cord deck rigging. You can fit there a couple of backpacks or even a large bag. They will, however, influence your stability on the board, as the heavy part should be in the back. But then, it'll be balanced with your own weight. The duo paddle is adjustable, so you can use it while standing, but also while sitting. When both paddles are on, it operates like a kayak paddle. It's definitely challenging to put this paddle board in a certain category because it looks like a jack of all trades. In other words, you can use it for recreational paddling, surfing and even racing. From this point of view, it can easily qualify as the best all around paddle board. Furthermore, it looks good and comes with a few bells and whistles as well. All in all, in terms of design, you only have one style available. It's a cocktail of blue and brown that looks stylish and elegant. It'll certainly make a statement on water. The board is made of multi-layer laminated wood stringers. There's nothing to worry about though – not even the effects of water over wood. The whole board is coated in a thick layer of resin. Resin is waterproof and gives the board a shiny and smooth appearance. As for the core, it is based on heat laminated high density EPS. This kind of material can last forever. Just like the top, the core is waterproof as well. In terms of sizing, the paddle board measures 126 x 30 x 5 inches. It has a standard width, so it's both stable and speedy. The thickness adds to its speed as well. Given the ratio for length and width, it looks narrow and suitable to racing as well, yet it cannot compete with a professional racing board. Other than that, this model can take people up to 300 pounds in weight. It's excellent for both small and overweight individuals. Bells and whistles add to its convenience, especially the camera mount. Make sure you have a water resistant camera though. The paddle can be adjusted between 63 and 83 inches in length, while transportation is piece of cake – the roof rack is padded, so it can go on any vehicle without any risks of damaging it. 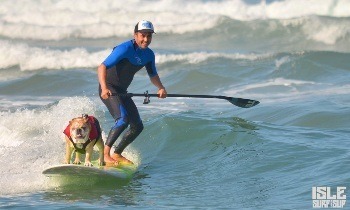 A surfing leash is included in the package too. If you think about it for a second, a general paddle board can take both men and women without too much hassle. However, there are certain manufacturers that make their boards based on genre, only to make sure that they're deeply customized. 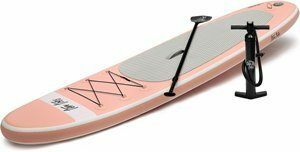 If you're looking for a specific paddle board for women, you're in the right place – Ten Toes is known for creating some of the best SUP for this category. This model is available in more colors and each of them has a feminine touch – from blush plink to coral and sea foam. The board measures 10 x 30 x 6 inches – standard size. 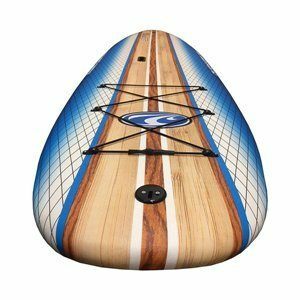 It's among the best inflatable paddle boards, mostly because it feels as stable and firm as a solid board. It does have one major advantage over classic boards though – it can be deflated and rolled up. You don't need a man to help with loading and unloading the board. You won't need a roof rack either, not to mention additional storage space. Instead, put it in a backpack and head to the beach. In terms of construction and durability, you'll benefit from military grade PVC. This board can last forever and can easily take some beating. However, you might ruin it on a fast river if you like kayaking, as banging it into rocks can damage the material. Based on the size, the paddle is recommended to both newbies and experienced riders. It makes no difference what your skill level is. It takes riders up to 250 pounds in weight and has all the accessories for a complete experience. The paddle is made of aluminum. It's lightweight and adjustable in height. The package also features three fins, a manual pump to inflate it and a repair kit for unexpected situations. 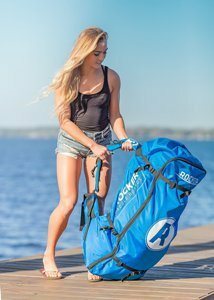 If portability and storage are your main concerns when buying a paddle board, this model has the solution. It's inflatable, so it's space efficient. When not in use, you can deflate it, fold it and store it in a backpack. Transporting it is just as simple, as you won't have to invest in a trailer or a roof rack. When inflated, it has handled on the nose and tail, so you can move it around with no problems at all. Despite being inflatable, it has the same properties as a solid board. The package is quite complete and allows you to start paddling as soon as you get the board. Apart from the actual board, you have an attached bungee rope, as well as a fin, a pump and a paddle. The paddle is made of fiberglass, so it's light and allows paddling for hours without feeling tired. It's made of three glasses, which means it's also space efficient. Although inflatable boards are not associated with strength and rigidity, that's only a misconception. This model can take up to 350 pounds of weight. It can easily take overweight riders as well. If fully inflated, it will feel as sturdy as a hard board. It's entirely made of military grade PVC, so it can take some beating without losing its robustness. The drop stitch design adds to its durability. In other words, you can forget about dents, cracks and dings – the most common issues with hard boards. Available in 150 x 30 x 5 inches, this model is probably the best touring SUP 2017 – at least judging by its ratings. It's slightly longer than the average boat for a speedier profile, yet it's lightweight – only 20.5 pounds. It has a classic width, so it's suitable to both amateurs and experts. It's the actual length that makes the difference. Moreover, it's slightly thicker than other similar units, so it feels stable as well. Turning will never be a problem. In terms of maximum weight capacity, it can take riders up to 275 pounds in weight – excellent for overweight users. Although it's sold as a touring paddle board, this unit is a multipurpose model. For example, its width makes it easy to use, so newbies can take it as an all-around board. The nose and tail are quite wide, so the board is stable on water. It makes a great choice for yoga enthusiasts too. Sure, it doesn't have all the features a yoga board should have, but it can still tackle your yoga exercises with no problems at all. 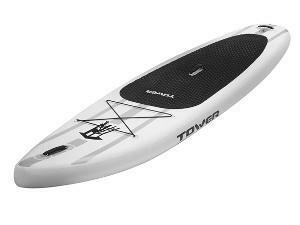 In terms of durability, it carries some general standards of inflatable boards these days. In other words, it's made of military grade PVC. Since it's inflatable, it's obviously easy to store and transport. Furthermore, you don't have to worry about dents and cracks. You also don't have to worry about inflating it because it comes with a high pressure pump. You can do it yourself whenever you go paddling. However, it's a tedious process, especially if you're not too much into fitness. Therefore, if you paddle often and you got plenty of storage space, you can just as well leave it inflated. In terms of accessories, you have the basics. The package comes with a paddle, as well as a high pressure pump and a carry backpack. The paddle is adjustable in length – 65 to 86 inches. Also, the surface features a stainless steel D ring, so you can tie the board up to boats or docks. 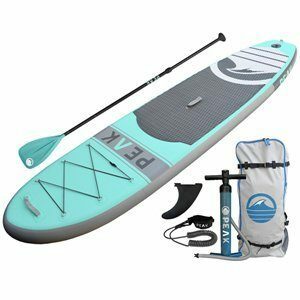 Measuring 126 x 31 x 6 inches when fully inflated, this paddle board from PEAK aims to take your experience to a new level. 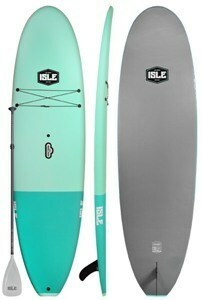 Unless you want a specialized board for yoga, racing or touring, this model is excellent because it's general. It makes no difference how experienced you are or if this is the first time you'll ride a board. At the same time, it's ideal to most conditions. It's quite stable on rivers and easy to run on lakes. The inflatable profile makes it easy to move, store and transport. When rolled up, it measures 11 x 36 inches – you can literally fit it inside a backpack. It weighs 23 pounds. The military grade PVC construction adds to its durability. Even if you ride it on fast rivers and bump into some rocks occasionally, chances are you won't have any problems. However, just like you have probably guessed already, the less stress it goes through, the more durable it becomes. While military grade PVC has multiple benefits (such as durability or the lack of dents and dings), it also has a drawback – it generates some resistance. Simply put, this board will never be as fast as a regular fiberglass board. The package includes a paddle, a carry backpack, a coil leash and a high pressure pump. The paddle is adjustable – 65 to 86 inches. The pump is handy, but it might exhaust you, especially if you're not the muscular type. If you don't feel like working out, you might have to purchase an electric pump too. As for the maximum weight, it can go up to 300 pounds. If you're an experienced rider, you can exceed that weight, yet the board will be harder to control. 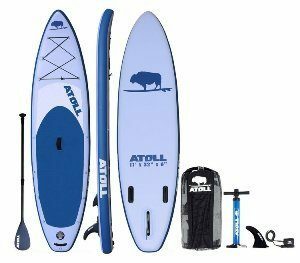 Atoll's paddle boards are better known for taking everything to a new level. No matter what the competition has, Atoll will add one more feature to make it better. This model makes no exception either. It's a relatively new design from this manufacturer. In other words, it's lighter and more durable. But when compared to its competition, it's actually heavier – 38 pounds. It's still not so hard to carry around. After all, you won't walk with it on your back for miles, but just to your car and then to the water. 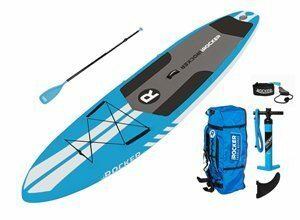 The package has everything you need to start paddling out of the box. You have a high pressure hand pump, as well as a repair kit for unexpected situations, front and back bungee tie downs and a carry backpack. The backpack won't feel heavy on your back due to the waist strap. As for the pump, it has dual action – it inflates when pushing and pulling, so it should take you less time to inflate the board. Unless you take this board to extreme rivers, chances are you'll never need the repair kit, yet it's still handy to have it around. The paddle is included in the package too. It's made of black aluminum alloy. It's lightweight and easy to operate, but it's also adjustable. The blade is made of nylon. It breaks down into three pieces. The same goes for the fin, which is removable. Putting it in doesn't require any tools. In terms of sizing, you can count on 132 x 32 x 11 inches. The board is thicker than other similar models, which means it's more stable. Sure, it feels a bit difficult to track or turn, especially if you compare it to hard boards. But then, it can take people up to 300 pounds or even more if they have enough experience to maneuver the board. Built to be both stable and rigid, iROCKER's inflatable model can qualify among the best SUP for all the excitement it comes with. The board comes in a standard size – 132 x 32 x 6 inches. It's classified as an all-around board, which means you can use it regardless of your skills. The extra width makes it more stable than specialized boards, hence its popularity among less experienced users. On the other hand, it compensates through a sporty design, so you won't compromise on speed. When fully inflated to 15PSI, it will feel like a classic hard board. However, it only weighs 27 pounds – about half the weight of a hard alternative. It's inflatable profile makes it simple to store and transport. The package includes a personalized carry backpack in its size. Roll it responsibly though. The paddle is made from fiberglass and can be adjusted. It floats, so don't worry if you drop it in the water by mistake. The blade is made from rubber, so you're less likely to chip it if you accidentally hit a rock. The other end can take another paddle to help you if you decide to convert the board into a kayak. However, the spare blade must be purchased separately. The hand pump is handy and comes with dual action. Inflating the paddle board shouldn't take too long, yet it will feel like a workout if you're not used to physical activity. While having a pump ensures you can ride the board out of the box, some buyers chose to buy their own electric pumps instead. Generally speaking, there are five major types of paddle boards out there. Each of them comes with its own features and specifications, so you'll have to determine what you want from this experience. For instance, surfing boards are quite narrow because they have to cut through waves. They're lightweight, but also short. This kind of design makes turning a breeze. Given the high performance, they're a bit more expensive than other categories. Also, they don't make such good options for long distance paddling due to the lack of stability. On the other hand, touring or all-around boards are multipurpose. They're long, wide and come with plenty of volume. They're obviously stable and allow paddling for hours with no issues at all. This model is ideal for newbies. Inflatable boards are not to be overlooked either. Their main role is to overcome the issues associated with classic boards. Storage and transportation will never raise any problems. You won't need too much space to store such a board, just like transportation is all about throwing it in the back of your car. They're not as stable as regular boards due to the lack of stiffness though. Finally, racing and yoga boards are for those with specific expectations in mind. If you want to become a professional and start competing, a racing board is a must. These models are all about speed. If you slow down, you lose stability. 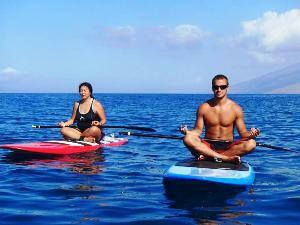 Yoga boards, on the other hand, are designed with relaxing exercises in mind. The top is soft, so they can take all kinds of workouts without causing any discomfort. So, what size SUP board is right for me? Once you decide on the optimal type of board, sizing is the next main step. The size is given in volume. A wide, long and thick board will obviously have plenty of volume. More volume means more stability. In other words, a high volume board is a must for beginners. If you are looking for a body board instead, check out this article. The drawback? The bigger a board is, the less responsive it becomes on water. Maneuvering it will be quite challenging, especially when it comes to turning. However, if you can control one of these models, you can control pretty much any board, regardless of its category. Consider moving and storing your paddle board too. Where do you plan to store it when not in use? Do you have enough space? How about taking it out? Can you fit it on your car? Do you need to rent a trailer for transportation? Your available budget is an important element too. After all, it dictates the final choice. The best board is not necessarily the most expensive one, just like the cheapest board is not the worst item on the market. Instead, look for cost efficiency based on your personal necessities. Bottom line, it does pay off researching the best paddle boards on the market before making a final decision. While most paddle boards share the same main features, small details make the difference. Plus, it's worth knowing what you expect from this experience. 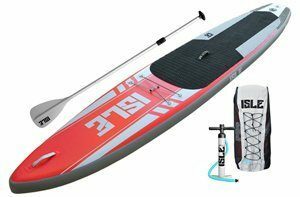 If you want a bit of everything, but plenty of fun and performance, chances are ISLE Cruiser Stand Up Paddle Board is your best choice. It's the most balanced unit on the market in terms of quality, results and adventure. We would rate this piece a 4.9 out of 5 stars. 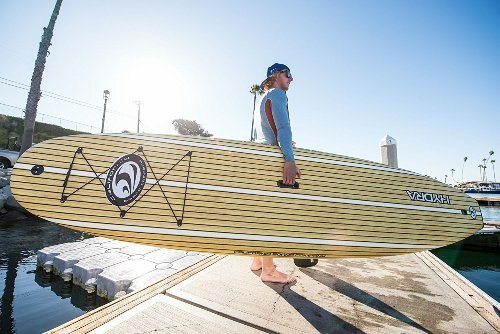 It may not have any specialized features, but it's an all-around paddle board and it certainly takes every aspect related to this industry to a new level.